Seeking to enroll an intellectually talented, dynamic, diverse, and active freshman class every fall term, the CMC Admission Committee closely evaluates every facet of the application for admission, academic as well as non-academic. CMC, a highly selective college, has in recent years admitted less than 15% of all applicants. The most important part of the application is the candidate’s high school record. Committee members consider strength of school, courses taken, grades earned, rank in class (if available), and counselor and teacher recommendations in evaluating each student. Competitive candidates for admission pursue the most demanding course work possible, receive strong grades, and are highly regarded by their teachers and counselors. Mathematics: Three years, preferably four. Candidates should recognize that mathematical skill is as important for professionals in government and economics as it is in engineering and the physical sciences. Foreign Language: At least three years. History: At least one year. Science: At least two years required, three strongly preferred. Science majors, including Economics and Engineering and Management-Engineering majors, should have had one year of physics and chemistry. The Admission Committee recognizes Advanced Placement (AP), International Baccalaureate (IB), and honors courses as more demanding than conventional courses, and gives appropriate consideration to those courses in the admission process. Students are welcome to submit either the SAT or the ACT test scores. Students must request the appropriate testing agency to submit official test scores directly to the College. The College does not accept scores from the transcript. Students who submit the ACT must also submit the ACT Writing Test. SAT Subject Tests are not required by Claremont McKenna College, except for home-schooled students. The Admission Committee considers extracurricular involvement very carefully. As a small residential college, the Committee looks for students who are talented and active, both inside and outside the classroom. Evidence of leadership and initiative is particularly important. The world into which CMC graduates will move is a diverse, complex community; to prepare our students to succeed in that world, CMC seeks an academically motivated and highly diverse student body. The College gives special consideration to candidates who have had disadvantaged backgrounds or unusual experiences, or who bring special talents to the campus community. Freshman applicants may begin to submit application as soon as it is available. CMC is an exclusive user of The Common Application For Undergraduate College Admission (Common App) for freshman candidates. Acceptance to CMC is, of course, contingent upon satisfactory completion of the final term of secondary school, or college (for transfer applicants). Specific information on CMC’s required application components is available on the Admission website. Interviews are optional and are informational. Only students who have completed their junior year of high school will be granted an interview. To schedule an interview, candidates must make appointments in advance by scheduling one on the Admission website. Interviews are not available to freshman candidates after mid-December or to transfer candidates after April 1. Interviews with CMC alumni can be scheduled in many areas outside of southern California. Information sessions and student-guided tours are available throughout the year. No appointment is necessary; interested students can register and see availability online. If CMC is clearly a student’s first choice, he or she may apply under one of CMC’s two Early Decision options. The Early Decision option is a binding agreement - if accepted, the student is expected to withdraw all other applications and not to initiate any new ones. The advantage of applying Early Decision is that candidates learn of an admission decision early in the senior year, possibly reducing the additional effort and cost of applying to other colleges. The only difference between the Early Decision I (November 1) and Early Decision II (January 2) options is the deadline for submission of the application. Students who are not sure that CMC is their first choice should apply under the regular decision program. Freshman candidates who apply under Early Decision may be admitted, deferred, or denied. Those who are admitted must understand that failure to comply with the Early Decision guidelines may result in rescission of the offer of admission. Candidates who are deferred are considered, without prejudice, with regular decision candidates later in the spring. These candidates are encouraged to submit applications elsewhere. Candidates who are denied are not reconsidered with the regular decision pool and should apply elsewhere; there is no appeal process for denial. There is no Early Decision program for transfer candidates. The McKenna Achievement Awards, annually renewable scholarships of $10,000, are given to approximately 15 incoming freshmen each year. Recipients have provided evidence of academic excellence, strong extracurricular achievements, and leadership. For more information, see Scholarships . The Frank Seaver Leadership Scholarship is a renewable full-tuition scholarship given to approximately four entering freshmen every year. This scholarship is awarded to students who demonstrate exceptional promise to become leaders intent on making a positive impact on the world. For more information, see Scholarships . The admission procedure for students who are citizens of foreign countries is the same as that for other students. However, foreign students must submit evidence that they are sufficiently fluent in English to be able to handle all coursework without undue handicap. The Test of English as a Foreign Language (TOEFL) or the International English Language Testing System (IELTS) test as well as the SAT or ACT is required for all foreign students. Students must request the appropriate testing agencies to send official test reports directly to CMC. A limited amount of need-based financial aid is available for international students. Competition is very selective. To be considered for need-based assistance, students must submit the Certification of Finances and the College Scholarship Service (CSS) Financial Aid PROFILE (both available from the College Board). CMC welcomes applications from home-schooled students. Because home-schooled students may have chosen a non-traditional path to obtain a high school education, the Admission Office works very closely with these applicants. Interviews with Admission Office staff members or with alumni in cities throughout the country or the world are required. A home school transcript organized by a parent, teacher, or educational agency, including course work information and/or an explanation of curricular approach. The SAT Reasoning Test or the ACT. Both must be taken with the writing section of the exam. Two SAT Subject Tests. The first exam must be in mathematics and the second should be in an academic discipline, such as English, foreign language, history, or science. A counselor letter, preferably from an educational supervisor, but it may be written by a parent. Two teacher letters, preferably from people who taught an academic subject. Extracurricular letter from a non-family member familiar with social or extracurricular activities (peer, clergy, employer, coach, etc.). All candidates who have taken academic coursework at a community college or another academic institution must ask the appropriate registrars to send official copies of all transcripts to the CMC Admission Office. Some of these courses may be used for one of the SAT subject tests. The standard rules on transfer credit for college work completed by incoming freshmen may not apply to home-schooled students; CMC is likely to consider some of their college courses as substitutes for junior or senior high school courses. Candidates who are veterans of the armed services should submit a copy of their honorable separation papers with their credentials. Veterans who have served at least two years may be eligible for elective credit towards graduation. For further information, see Transfer Credit and Veterans or contact the Admission Office or the Registrar. Freshman candidates accepted for admission who send a commitment deposit may delay entrance for one or two semesters. They must write the Admission Office to describe their plans and request the deferment, preferably before June 1. All students wishing to transfer from another college or university must submit transcripts of all college work, in addition to all other credentials required of freshman candidates, including high school transcripts and SAT or ACT scores. Interviews are optional. If the college transcript does not list courses in which the student is currently registered, that list must be submitted to facilitate credit evaluation. Preference is given to those who submit their credentials by April 1; notices of admission decisions are mailed by May 15. Students who have not done well at the academic institution previously attended will not be considered and transfer applicants must provide an official statement confirming that they left their previous institution in good standing. All transfer students are expected to complete two years of full-time study at CMC, and at least 16 courses must be taken and passed while attending the College. Advanced standing for more than two years is never granted regardless of the number of college courses completed prior to enrollment at CMC. Although most transfer students enter CMC in September, a few may be accepted for mid-year entrance (courses begin in mid-January). Full consideration can be guaranteed only to those whose credentials are complete by November 1; financial aid applications are also due by November 1. other applicable dates are listed below. Transfer students must use the Common Application for Transfer Admission. CMC encourages students to take challenging academic courses in high school, including Advanced Placement (AP) and International Baccalaureate (IB) courses, and to take the appropriate exams. The maximum amount of credit students may receive for AP and/or IB exams is the equivalent of four (4) CMC courses. For details on CMC’s policies on credit and/or placement for AP and IB exams, see AP and IB Credit and Placement . Students entering CMC as freshmen may receive transfer credit for a maximum of four (4) CMC courses for college coursework completed prior to their enrollment at CMC. Such credit may be granted in addition to any college credit for AP or IB examinations. To be eligible for transfer credit, all college courses must be part of the standard college curriculum. College courses taken to satisfy high school graduation requirements cannot be used for college credit at CMC. Students in dual enrollment programs (high school-college) or home-schooled students who are taking college courses prior to their enrollment at CMC should contact the Admission Office to discuss transfer credit questions. See Transfer Credit and Freshmen for further information. Students entering CMC as freshmen may not complete more than four (4) general education requirements off-campus before entering CMC or while enrolled at CMC (in summer school, through Advanced Placement or International Baccalaureate, study abroad, etc.). There is no limit to the number of college courses transfer students may take before enrolling at CMC, but only the equivalent of 16 CMC course credits, including credit for AP and IB exams, will be accepted toward graduation. No transfer credit will be granted for courses challenged by examination at other institutions, or for special courses or exams for which other academic institutions may have granted credit, including CLEP, etc. New transfer students must provide the registrar with official final transcripts from all previously attended institutions. Course descriptions, syllabi, translations, and other documentation may be required before the college work can be evaluated for credit. A transfer entrant may be given credit for any course completed with a grade of C (2.00 if A=4 grade points; 6.00 if A=12 grade points) or better at another accredited college or university, if the course is comparable to courses offered at The Claremont Colleges during the academic year. For transfer credit calculation purposes, a course credit at CMC is considered the equivalent of four (4) semester units or six (6) quarter units. For further information, see Transfer Credit Policies . Transfer students who, after enrolling at CMC, wish to bring in additional summer school credits must consult with the registrar to determine if they are eligible for additional transfer or general education credits. Students seeking to transfer from unaccredited institutions may petition for credit after completion of at least one semester of full-time academic work at CMC with a grade point average of B (9.00) or better. Department chairs also may require that these students take any appropriate substantiating examinations. A tuition deposit of $500 is required of all accepted applicants at the time they notify CMC that they plan to enter. Confirmation of final admission is contingent upon receipt of this deposit. The deposit will be credited directly to the student’s account and is not refundable if the student withdraws from the entering class before registration. Receipt of this deposit and the student’s signature constitutes a decision to attend CMC; therefore, students must withdraw applications from all other colleges to which they have been admitted. Should CMC learn that a student has made a commitment to attend more than one college, CMC’s offer of admission may be rescinded. An official transcript showing final grades and a notation of graduation (freshmen only) must be sent to CMC upon completion of the last term. Freshmen with missing high school transcripts and transfer students with missing final college transcripts will not be allowed to participate in pre-registration for the following semester. Both freshmen and transfer candidates who are admitted are expected to continue to excel in their program prior to enrollment at CMC. Failure to complete courses in progress at a satisfactory level may result in rescission of admission. If a student is in danger of failing to complete senior-year work at a satisfactory level, they must consult the Admission Office prior to the receipt of their final transcript. In addition to the $500 tuition deposit, a security deposit of $200 is required of all accepted applicants at the time they return the housing letter. The deposit is retained until after the student’s graduation or withdrawal, when it is refunded after any proper charges have been deducted. The medical certificate, required of all students prior to entrance, must include a physical examination, tuberculin test, chest X-ray of anyone with a positive tuberculin test within the past six months, and active immunization against tetanus. 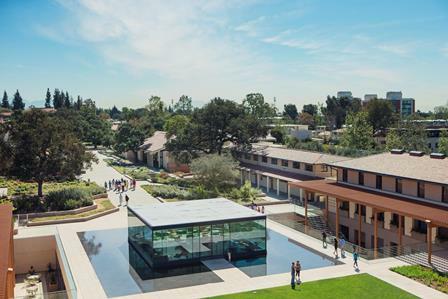 The Robert Day School at Claremont McKenna College offers highly qualified students a one-year Master of Arts in Finance degree. Applications are accepted on a rolling basis beginning in the fall of each year for admission the following fall. For details, see Master of Arts in Finance .